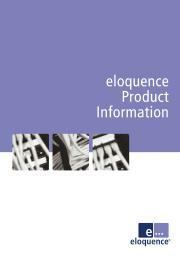 Eloquence is a well integrated development and runtime environment which significantly improves productivity. Developers can easily design and implement complex business applications or customize existing programs on the fly. Since Eloquence was released in 1990, thousands of installations have confirmed this. Software partners in many parts of the world appreciate Eloquence as a powerful, reliable and flexible means for cost-effective development, execution, customization and maintenance of commercial applications. A host of features, not found in such a combination in other development and run-time environments, makes Eloquence unique and well suited to virtually all data processing tasks. The TurboIMAGE compatibility extension opens up an easy, cost-effective migration path for HP e3000 business applications. The Eloquence database offers compatibility beyond intrinsics and allows migration of HP e3000 applications with typically no effort. Database migration is just a matter of data export and data import. Eloquence Database Server and Workstation are also fully supported on Itanium servers (HP-UX and Linux).